This revision of the 3274 is the same as the previous revision except that it has a metal plate on the back to make encoder mounting possible. The 3274 is a 24 volt gear motor, generating 173 Kg-cm of torque at 15 RPM. It's a large motor that provides an amazing amount of torque. The planetary gearbox on this motor is more sophisticated than a typical spur gearbox and will provide greater efficiency, higher torque, and quieter motor operation. This revision of the 3274 has had its rear shaft and mounting holes changed to be compatible with the 3531 - Optical Rotary Encoder HKT22. 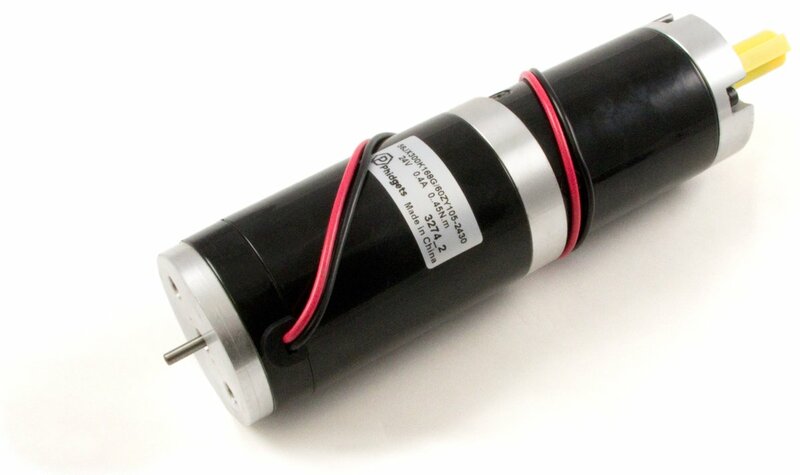 This motor can be controlled by a DC motor controller. You can find a list of suitable controllers on the Connection & Compatibility tab. The torque this motor produces when it stalls exceeds the rated strength of the gearbox. This means that stalling or very heavily loading this motor can cause serious damage to the gearbox. To avoid damage, avoid sudden loads or any load higher than the Maximum Strength of Gears spec.